I recently bought a few Atmega328PU chips to use in some project. Its better to use these bare ICs in the circuits instead of putting the whole Arduino Uno or Nano board, as their cost is higher. But the problem with bare Atmega328 ICs is that usually there is no bootloader installed in them and you need a saperate programmer to program them before you put them in your circuits. 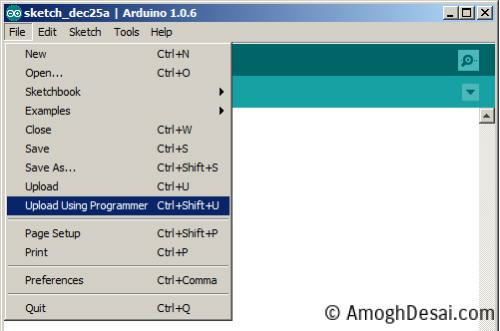 Arduino’s official website shows this easy way of using Arduino Uno as a programmer for the Atmega328 IC, but what if I have an Arduino Nano?You need to modify this circuit a little to work with a Nano. 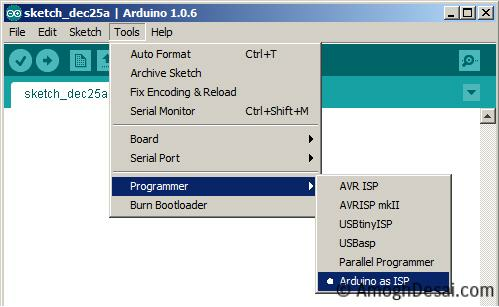 Once you have built this circuit, you are ready to burn a bootloader or burn a sketch to an Atmega328PU or P.
First install a stable version of latest Arduino IDE from here. 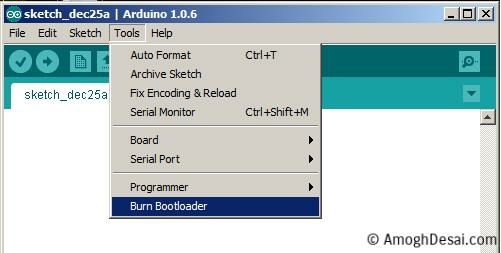 Burning a bootloader to Atmega328. Connect the Circuit to the Computer using USB cable. Burning a sketch to Atmega328. Now copy paste or write the sketch in the programming window. You can also copy a downloaded sketch to the sketch directory. On windows its located at C:Users*username*DocumentsArduino Make sure you put each sketch in a specific directory. 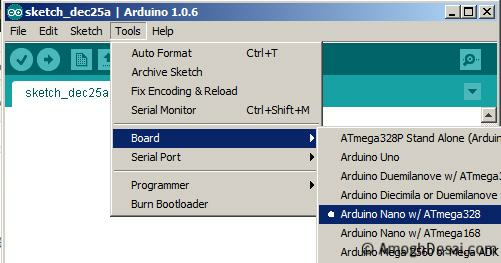 This way in Arduino IDE you can directly go to File =>Sketchbook => Select the sketch you want to burn. Once you have written/copy pasted or selected the sketch click on Sketch => Verify/Compile. Once the Sketch is burnt to your IC, you are all set to use this chip in your circuits. Let me know if you get any issues or there are any suggestions you want to make to improve this post. You can leave your comments below! Hi Amogh, Lal here ( VU2 LBQ). Ex Pune HAM 😉 from Calicut. I request some guidance from you regarding Arduino. I remembered your old blog post when came the topic of Arduino based project. Nice to hear back from you. Infact I have done a temperature and Humidity measurement project, but forgot to blog about it. Ill send you the details in an email. Amogh, Thank you for blogging this information. Very helpful and most appreciated. 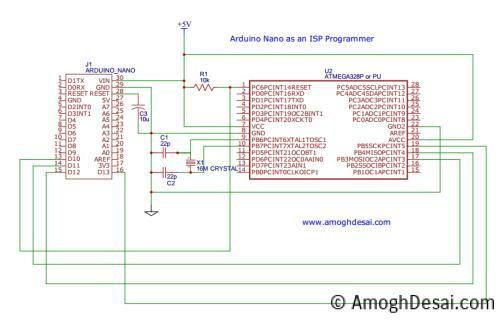 i am just beginner for aurduino nano and atmega328p. I have suggested this to many other earlier as well.. Please use Arduino IDE 1.8.5 and try it again. Many other were successful, try and let me know. 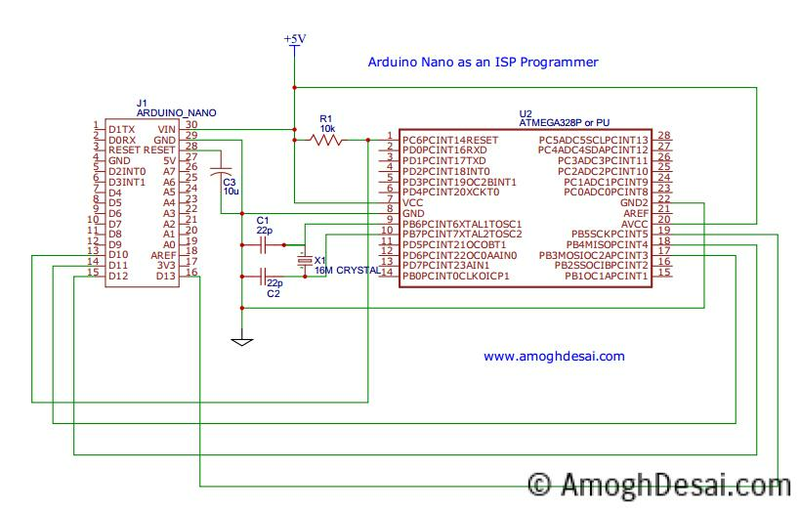 To burn code and use it with serial monitor, you will need the crystal and other basic circuitry with the atmega328p. You cant use the bare atmega328p ic with just power. Previous Post: HFI 2014 – BITX40 Design – Everything you want to know!